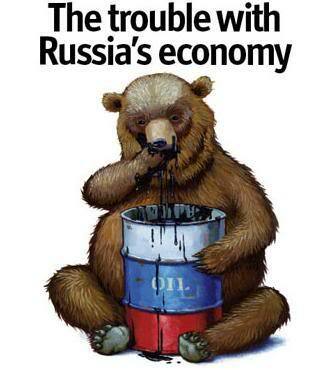 This is how the Economist celebrates Russia’s presidential election – the Trouble with Russia’s Economy, represented by a bear gorging itself on oil (i.e. invoking the Myth of the Russian Oil Curse, which we have debunked far too many times to count on this blog). Guess we’ll have to do it again. Never mind that organizations like the the World Bank, academic econometricians and even their own Economist Intelligence Unit disagrees, and that there is also OECD academic work that argues that ‘the resource curse – if it exists – is at least no fatalité’. But whatever. Let’s analyse the article on what it says..
From the get go, the machine gears itself up for agitprop mode. Obviously the views of this one businessman reflect the views of the entire Russian business community. Next they proceed to admit the blindingly obvious – yes, the Russian economy is no longer a basket case; yes, it has half a trillion dollars of FOREX reserves; yes, there is a consumption boom. (This is the difference between Soviet and Western propaganda: the latter, being much more subtle and nowhere near as overtly propagandistic, is thus far more effective and insidious than the latter). Of course, this tone doesn’t last. By the end of 1999 Russia was already growing by more than 6% a year. In 2000 growth accelerated to 10%, a rate still not matched eight years later. Immediately after they throw in a red herring, ostensibly proving that there is a gap between Russia’s potential growth rate of 10% and its real growth rate of 7%. Of course, what they decline to mention is that is that this is coming hard to on the heels of post-Soviet collapse and the 1998 financial crisis (which by official statistics shaved off around 40% of Russia’s GDP from its Soviet peak to post-Soviet nadir) – recovery is typically quick in the aftermath of economic downturns, as all that is involved is filling back underused capacity. To be fair, at first Mr Putin worked hard to consolidate growth. His government simplified and cut taxes. Budget reform brought clarity and stopped the government making unrealistic pledges on spending. Mr Putin not only chose a liberal economist, Andrei Illarionov, as his economic adviser, but also listened to him. For the most part Russia used its oil windfall prudently, repaying debt, building up reserves and filling its stabilisation fund. They deign to acknowledge Putin’s early achievements, although the attributal of it specifically and exclusively to Mr. Illarionov (a neocon dinosaur who disputes global warming, cites Freedom House reports and can’t even get the size of Russia’s GDP right) is dishonest. crude-oil production controlled by state and semi-state companies doubled. Growth in oil output, which before the Yukos affair had been running at about 9% a year, slowed to just 1% by the end of 2007. Three points have to be made. Firstly, it is true that state ownership has increased in the hydrocarbons and some other extractive sectors. It is also true that the trend growth rate for oil extraction dropped from 9% from 2000 to 2004 to 2.5% from 2005 on. To project a linear relation between this and a slowdown in production, however, is simplistic at best. To see why, analyze the graph below. This shows Russian oil production, historic and projected, from 1990 to 2050 (the table itself was compiled around 2000). The shaded areas show the the amount of oil discovered in that particular year. Anyone familiar with the theory of peak oil will be aware of the fact that the amount of economically viable black gold is limited (at a specified price). 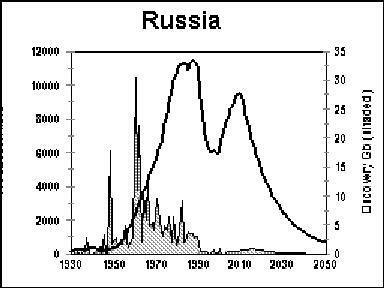 Russia already had its oil peak, in 1987. Continuous big new discoveries have practically ceased since 1990. Now from the late 1990’s a confluence of factors ensured that Russia (and the post-Soviet world in general) experienced a second peak. These were a) privatization of oil companies, b) increased investment due to post-2000 oil price rises and, mostly importantly by far, c) an influx of Western technical expertise, which vastly increased recovery rates. Indeed, the second peak has mostly been driven by increased extraction at Siberian super-giant fields due to improved technology. Nonetheless, this only had the effect of increasing recoverable reserves; it did not increase them per se. Indeed, many analysts (including the one who compiled that graph) have been projecting Russia’s oil peak to around about 2010. Since the Hubbert peak is bell-shaped (i.e. slopes rapidly up, slowly approaches a plateau, and then increasingly slopes downwards), it would make sense for Russia’s oil production to be slowing from the mid-2000’s. Hence the aforementioned reduction in production was far more likely due to general peak oil dynamics rather than to government intervention in the sector. Yes, state ownership in the oil industry rose from below 20% in 2004 to over 50% in 2007. Nonetheless, there is still a huge swathe of Russian oil companies not under government control (the mainstay being Lukoil, which accounts for some). Even here, there are several caveats. For starters, state-owned oil and gas companies do not necessarily have to perform worse than private ones – even in the case of Russia, Lukoil’s hydrocarbons production grew by 2% in 2007 – slightly below the 3% average of 2007 for the industry as a whole. Secondly, it is not clear whether increasing production is even currently desirable for Russia from a longterm perspective, since the value of oil is only set to increase in the future. Finally, the Economist, like capitalists and the BBC, conveniently sells us the rope by which we’ll hang them. Yes, oil output growth has plumetted from 2000-2004 to 2005-2007. But this makes a mockery of the argument that Russian recent growth has been based on oil. This is because acording to Rosstat, GDP growth has been 6.9% from 2000-2004 (i.e. including the anomolous year of 2000, when growth was 10%). During this period, around a third of Russia’s GDP growth came from increasing hydrocarbons production, according to academic studies. 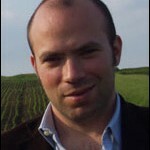 From 2005-2007, however, growth was 6.4% in 2005, 7.4% in 2006 and 8.1% in 2007, for an average of 7.3% over the period. In other words, despite the step drop in oil output rise to a sluggish 2-3% per year, real GDP growth has actually increased! I’m not sure what they’re doing quoting Naishul. Even this libertarian’s views are much more nuanced than those of the Economist. That problem is as old as Russia, but under Mr Yeltsin the courts, however corrupt, were at least independent of the Kremlin. Under Mr Putin, judges have again turned into bureaucrats who rubber-stamp dubious administrative decisions. Quoting Nicolai Petro’s excellent essay Russia through the Looking Glass in extenso will suffice to refute. Historically Russians have had little faith in their legal system, but this too is changing under Putin. Thanks to a new criminal code and code of criminal procedures passed in 2002, a judge must approve arrest warrants, and the accused charged with a crime within two weeks, or released. Nationwide jury trials, another Putin innovation, today acquit 20% of cases; in 2005 Russia had its highest acquittal rate ever. The constitutional court under chief justice Valery Zorkin has set a more independent course, criticising the December 2003 electoral law, striking down restrictions on media coverage of elections, and strengthening the rights of defendants and the role of juries. There are also clear signs that this liberalisation is continuing. In January 2006, the annual conference of chairs of regional courts proposed sweeping reforms that would virtually eliminate closed judicial proceedings. The state Duma (lower house of parliament) also passed, in a first reading, an important initiative in defence of privacy rights. This established a federal agency where a citizen can find out what information the government is gathering about him or her, and where this information is being kept. It should therefore come as no surprise to learn that the number of citizens turning to courts for redress of their grievances has shot up from one million under Yeltsin to six million under Putin, and that 71% of plaintiffs win the cases they bring against government authorities. “After Yukos nobody can feel safe,” says the owner of a factory making kitchen shelves in Kaluga. Instead of cultivating the rule of law, as Mr Putin promised, Russia was subjected to the rule of thugs, says Mr Illarionov. Oh dear. A kitchen shelves manufacturer in a provincial backwater and a neocon maverick. Can’t they do any better? Disappointing effort, chaps. The deterioration of Russian institutions has been tracked by the World Bank, Transparency International, the World Economic Forum and Freedom House. Russia’s corruption is on a level with Togo’s. 1. I have searched and I have found no World Bank metric that tracks institutions. If anyone can enlighten me please do so. The only thing vaguely related to this is the World Bank Group’s Doing Business project – while Russia’s rank there is far from impressive (106th out of 177 countries), conditions in 2008 are better than in 2004, when it was started. Edit 25/03/2008: I have succeded in finding what they were talking about – WB Worldwide Governance Indicators. In fact, there was no broad deterioration – rather, stagnation. From 1996-2006, “control of corruption” slightly improved, “rule of law” stagnated and “voice and accountability” fell a little, to take a sample. A word of caution, however – like Transparency’s CPI, it is a measure of perceptions rather than objective reality. This is reflected in the rather absurd figures for ‘political stability’, which imply Russia was as stable in 2004-2006 as in 1996-2000 (when Yeltsin was appointing a new PM every other week). 2. It’s true that Russia’s Corruption Perceptions Index has fallen from 2.8 in 2003 to 2.3 in 2007. However, the Myth of Russian Endemic Corruption has been shown for what it is (a myth) in my article Reading Russia Right. I’ve quoted the relevant parts and inserted further comments in italics. While there’s no denying Russia is plagued by corruption, to suggest it is endemic like in a failed state is ludicrous – and would frankly be obvious to anyone who has visited the countries on that list. The problem with the the Corruption Perceptions Index is that it’s a survey of outsider businesspeople and their subjective perception of the situation. While improving perceptions is an important goal, it does not necessarily correlate perfectly with reality. TI’s Global Corruption Barometer asks ordinary people how affected they are by corruption, for instance, have you paid a bribe to obtain a service this year? In 2007, 17% of Russians did – putting them into the same quintile as Bulgaria, Turkey and the Czech Republic. In other words, slap bang in the middle of world corruption, rather than at the end. As another example, Cameroon (2.4) is above Russia (2.3) in the CPI – however, some 79% of Cameroonians had to pay for a service in 2007, compared with 17% of Russians. 3. As for the WEF’s Global Competitiveness Rankings from 2006 to 2007, that’s an outright lie. Russia’s score went from 3.68 in 2004, 3.53 in 2005 and 4.08 in 2006 to 4.19 in 2007. It has also improved on its global rankings. 4. As far as I’m concerned Freedom House is a CIA front and its ‘findings’ should be taken with a pinch, or rather a barrelful, of salt. Yet foreign and domestic investment keep rising, along with Russia’s credit rating. 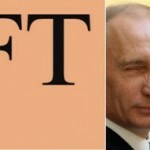 A survey of 106 foreign firms in Russia last year showed that 82% were broadly satisfied with the investment climate. Russian businessmen may grumble, but they still put up their money. Last year fixed capital investment rose by a record 21%, leading some economists to talk of an investment boom. And as far as I’m concerned, these statistics mean more than any number of Western think-tank reports. The real cost is one of lost opportunities. Growth of 7% sounds good, but it is far below Russia’s potential. Over the past few years, Russia has been outstripped (though from a lower base) by the former Soviet republics of Ukraine and Georgia, which have no oil. If Russia enjoyed the rule of law, was not stifled by inefficient monopolies such as the gas giant Gazprom and had roads rather than vague directions, its growth—given the oil boom—could surely have been in double digits. According to IMF figures (note: 2006 and 2007 are projections: as such, I replaced them with official figures), from 2000 to the present average annual GDP growth was 7.3% in the Ukraine and 7.2% in Georgia, as compared to Russia’s 7.0%, so to talk of Russia being ‘outstripped’ is misleading, to be charitable. Secondly, this has been from much lower bases (GDP per capita in 2007 was 14,600$ in Russia, 6,900$ in Ukraine and 4,200$ in Georgia). Thirdly, unlike Russia, which to date has overtaken its 1992 GDP index by 11%, Georgia and Ukraine are both at around 80% of their immediate post-independence figures. Furthermore, average growth rates for Russia, Ukraine and Georgia from 2005-2007 (when oil production became a burden rather than a driver for Russia) were 7.3%, 5.5% and 9.5% respectively, so the real question should be – why is Ukraine growing so slowly? The share of oil and gas in Russia’s GDP has increased, according to the Institute of Economic Analysis, from 12.7% in 1999 to 31.6% in 2007. Natural resources account for 80% of exports. Like a powerful drug, oil money has masked the pain caused to the Russian economy by the Kremlin. But the disease remains. So we return back to Russia’s economy is an oil bubble thesis. OK. Oil prices have risen from 16.56$ / barrel in 1999 to 64.20$ / barrel in 2007 – in other words, by a factor of 3.9. On the other hand, its share in the Russian economy increased by just 2.5. While far from economically rigorous, this does suggest that in real terms the contributions of oil and gas to Russia’s economy have fallen. It also misses out the fact that since 1999 Russia’s MER GDP has expanded more than sixfold (from 196bn $ to 1286bn $), so even by that metric its non oil-related growth at international prices is extremely impressive. It is true that natural resources account for 80% of exports (as opposed to 70% in 2000 – but this is again thanks to increases in the oil price). However, this is because of Russia’s comparative advantage in oil production. It strengthens the ruble, drives up labor costs and makes life difficult for manufacturers who want to export stuff. If Russia didn’t have oil, its export structure would be similar to Ukraine’s (machinery, equipment and metals). Resources aren’t a curse; they’re a blessing. The problem, says Peter Aven, the head of Alfa Bank, is that Russia has failed to convert the oil stimulus into domestic production. Imports are growing much faster than manufacturing. So what is their solution? Use the oil money to subsidize industrial expansion like in the Soviet Union? I also don’t see the link between imports and manufacturing – surely he doesn’t fall into the fallacy of thinking manufacturing is somehow more important/real than other sectors? Is retail, construction, finance, transport, any less important to a productive economy (all of which have been growing at 10+%)? The rapid real appreciation of the rouble is hurting Russia’s producers, and many goods are of poor quality. This is why Algeria says it wants to return 15 military jets it purchased from Russia. So what is their solution? The Central Bank does have a fine balancing act to carry out with limiting ruble appreciation and limiting inflation. In any case currency appreciation should typically force manufacturers to become more competitive. Productivity remains far below that of most developed countries. In the first years after the 1998 crisis, labour and capital efficiency went up by 5.8% a year. But that growth was driven by using spare capacity left from Soviet times. Sustaining it will require more investment. Without citing specific time frames or providing more recent estimates, this information is meaningless. As for investment, they have answered their own concerns. Do they even bother proof-reading this drivel? Last year fixed capital investment rose by a record 21%, leading some economists to talk of an investment boom. Officials have been trying to persuade themselves and others that Russia is an island of stability in a sea of economic troubles. But Yegor Gaidar, a liberal economist and former prime minister, says the Russian economy is highly sensitive to swings in the world economy. True, at least as far as the resources and financial services based part of the economy goes. But as has been pointed out in this blog here and elsewhere, Russia has a twin surplus, half a billion dollars in FOREX reserves and minimal exposure to the mortgage crisis, which should stand it in better stead relative to many of the advanced industrial nations. When the oil price is unpredictable and inflation is in double digits, spending more money seems unwise. Yet this is what Russia has been doing. After years of fiscal discipline, last year’s budget saw spending rise by 20% in real terms…The main beneficiaries of the spending increase last year were newly created state corporations, including those involved in nanotechnology and the 2014 winter Olympics—and those bureaucrats, who are skilled at enriching themselves. Russian inflation is powered above all by foreign currency inflows and the global tendency towards expensive food and oil. Increased spending on strategic investments like this are unlikely to have much impact. It should also be borne in mind that nanotechnology in particular is a very wise strategic investment, as I’ve argued here. It is little wonder that the gap between the top 10% and the bottom 10% of the population is growing, along with a sense of injustice. Russians have turned a blind eye to all this because average incomes are rising. If the trend reverses, they may start to ask harder questions. Since 1994, the Gini index has remained generally constant in Russia according to the World Bank. It’s said that to knock down a creaky old house you only have to kick the door in and the whole rotten structure will come tumbling down. I think I’ve done that here. The article is a mass of red herrings and ocassional false statements, narrated throughout by a deranged neocon (Illarionov). Once again the Economist is revealed as nothing but a highbrow rag when it comes to Russia coverage. Sean rips McFaul a new one – the full article can be read here on the eXile, critisizing his ridiculous Myth of the Authoritarian Model thesis (nothing there that you wouldn’t find in the writings of the likes of Lucas, just couched in quasi-academic language). For a comprehensive debunking see Fedia’s A Brave Kremlinologist. Too bad for him., which uncovers two outright lies and numerous statistical manipulations in the article. (For a laugh, read Stoner-Weiss’, the co-author’s reply, or more likely someone who claims to be her. Entertaining either way). Taling about Fedia, he has also put up an absolutely excellent post exposing the lies and manipulation that lie at the heart of the Committee to Protect Journalists, which claims to apply ‘strict journalistic standards’ to investigate suspicious journalist deaths resulting from their professional work. He does this by examining all 17 cases reported in CPJ’s database of confirmed deaths during Putin’s presidency (2000-present day) to see if they belong to “confirmed” cases of journalists killed in the line of duty. I quote the summary of An Audit of the Committee to Protect Journalists’ Claims. In summary, CPJ claims that 17 journalists were killed in Russia in since 2000 due to their professional activities. Examination of each case found that out of 17 claims, only 5 were correct (Domnikov, Khasanov, Klebnikov, Makeev, Politkovskaya), 8 were complete falsifications (Skryl, Ivanov, Scott, Shchekochikhin, Sidorov, Kochetkov, Maksimov, Safronov), and 4 were partial falsifications (Yatsina, Yefremov, Markevich, Varisov). If we assign the truthfulness value of 50% to partially falsified claims, the overall truthfulness rate of CPJ, given this sample, is 41%. Clearly, CPJ’s definition of “strict journalistic standards” as being only 40% truthful is at variance with what any reasonable person would expect. But it is very much in line with what one would expect from a propaganda outlet. Of course, the desire to protect journalists’ lives is very noble. But the end does not justify the means. Engaging in outright falsifications while making the outrageous claim that “strict journalistic standards” are being followed discredits journalism as a profession and raises the obvious question of why should any special emphasis be placed on protecting that kind of people? Demented Russophobe Loco Lucas continues his ravings, this time swallowing his laissez-faire capitalist instincts to pander to the left-wing readers of the British daily the Guardian with his messianic revelation of the New Cold War in Putin’s Playground. As can be gleaned from the Comments, his readers aren’t much impressed, nor most of those commenting on his blog (including yours truly). There’s also his delightful 19th January Daily Mail piece (a British rag mostly read by their unwashed football hooligans) – Putin: the brutal despot who is dragging the West into a new Cold War – I demolished his thesis on Lucas’ blog here, as well as having a flame war with the Estonian crypto-fascist Giustino. The eXile also trashed it, both before and after publication.